O St Lucy, preserve the light of my eyes so that I may see the beauties of creation, the glow of the sun, the colour of the flowers and the smile of children. Preserve also the eyes of my soul, the faith, through which I can know my God, understand His teachings, recognise His love for me and never miss the road that leads me to where you, St Lucy, can be found in the company of the angels and saints. 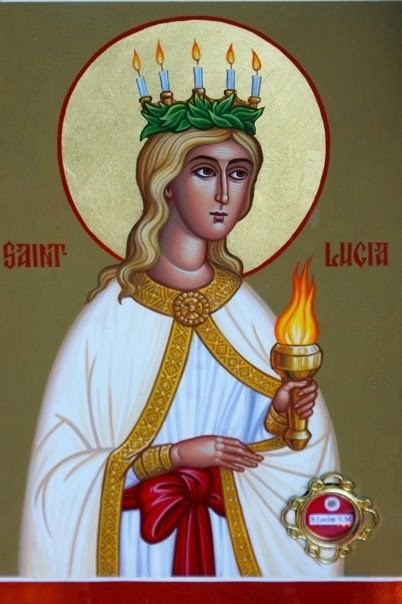 St Lucy, protect my eyes and preserve my faith. Amen. O! Glorious St Lucy, Virgin and Martyr, you greatly glorified the Lord by preferring to sacrifice your life rather than be unfaithful. Come to our aid and, through the love of this same most loveable Lord, save us from all infirmities of the eyes and the danger of losing them. Through your powerful intercession, may we spend our life in the peace of the Lord and be able to see Him with our transfigured eyes in the eternal splendour of the Celestial Homeland. Amen. St Lucy, pray for us and for the most needy, to Christ our Lord. Amen.